Please fill in the comment section with date and location and any other relevent information such as gender of the animal, noticeable scars and behaviour. The copyright of the photographs taken will at all times remain the property of the individual submitting the picture. The photographs and contact information of the individual will be used for identification purposes only and will not be sent to or used by any third party. Photographs will not be used for any other purpose without prior permission from the owner. 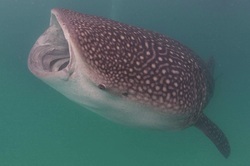 Sharkwatch Arabia would like to thank UAE photographer Warren Baverstock for donating his amazing photos to the project, please check out his website www.verstodigital.com. People submitting images can also opt to have their images uploaded onto the global database at Ecocean (www.whaleshark.org). By simply ticking the yes box below we will upload your image, in your name (you retain the name and copyright to your image at all times), to see if your shark has been spotted elsewhere in the world and notify you accordingly! The correct way to photograph a whale shark; the SPOTS are the key! 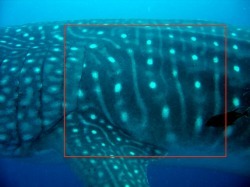 The area in the red box on either side of the body is the area of the whale shark that is the most important for identification. Please try and be level with the shark when the photograph is taken. The spots in this area of the body are unique to every shark, just like a human fingerprint and this is how they are identified. Ideally both sides of the shark will be photographed in this way for the best possible ID. It is also very helpful to take photographs of any visible scars that the animal may have. If possible to also photograph from below to determine if the animal is male or female; does it have claspers or not?